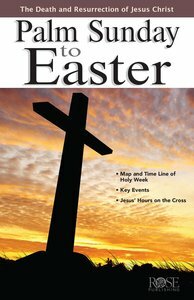 Packed with charts, diagrams, and simple summaries, this quick-reference pamphlet-Palm Sunday to Easter-covers the important teaching and events of Jesus' life throughout Holy Week. Discover how Jesus' death and resurrection fulfilled over 22 Old Testament prophecies. This pamphlet is perfect for individual reference, an Easter Bible study, Easter Sunday school lessons, and homeschool Bible curriculum. • Map and Diagram of Jerusalem at the time of Jesus that walks you day by day through the week leading up to Jesus' death and Resurrection Easily see where each of the key events leading up to Jesus' death occurred with this labeled, detailed, and drawn-to-scale diagram of Jerusalem during the time of Jesus. • Timeline Showing 22 Key Events as They Occurred Hour-by-Hour before Jesus' CrucifixionThis clock diagram/timeline shows 22 key events as they happened hour-by hour leading up to Jesus' death. It starts with Jesus being taken before Pilate and ends with his death on the cross. Explains Jesus' last words on the Cross, the words of the thieves crucified next to Jesus, and centurion's confession, from the 3rd Hour (about 9 am) to the 9th Hour (6 pm) when Jesus died. It uses Roman (modern) expression of time as well as Jewish. •Easy-to-follow chart covering 22 Old Testament Prophecies and their New Testament Fulfillment by Jesus' Death and Resurrection. • Brief Overview of the Physical Trauma Endured by JesusExplains the medical effects of Jesus' mistreatments. He was flogged, beaten, pierced with a spear, crucified, and ultimately died-all of that for our transgressions. The 5-6 inch spikes that were driven into his wrist and feet more than likely severed major nerves, making breathing difficult and possibly leading to heart failure. This is an excellent meditation on how much Jesus loved the world, and how he voluntarily laid down his life in such a dramatic way to save us. "Impressive! Rose Publishing's Palm Sunday to Easter Pamphlet is visually stunning and informative in a way that grabs your attention and draws you in. Following Jesus from Palm Sunday to Easter is a refreshing journey through the events of this critical part of Jesus mission 'To seek and save that which was lost,' Luke 19:10 NASB. The quantity of details is wonderfully informative and could be used by an individual, family, small group Sunday School class or the entire church. It would even be a great gift for someone unfamiliar with the good news." "Palm Sunday to Easter contains a fantastic timeline with key Scriptures detailing Jesus' time on the cross. This visual tool forms a great picture of what this window of time was really like. It gives a detailed medical description of His sufferings, which humbled me, made me grateful, and put me in awe of Christ's strength. This pamphlet is a wonderful guide for those wanting to submerge themselves deeper into Passion Week." ?I love the overview that is shown of Jesus' last week before the crucifixion, including before Palm Sunday. Included is a map that shows where these events took place?There is a pictorial description of the tomb as well as several archaeological discoveries. This pamphlet lists the prophesies of Jesus' death and resurrection as supported by Scripture in the Old and New Testament? This pamphlet will be a welcome addition to the Rose pamphlet library and it should be a bestseller. This pamphlet can be a great handout for churches on Palm Sunday.? About "Palm Sunday to Easter (Rose Guide Series)"